In recent decades, the diffusion of digital technology into nearly every business and workplace, also known as “digitalization,” has been remaking the U.S. economy and the world of work. The “digitalization of everything” has at once increased the potential of individuals, firms, and society while also contributing to a series of troublesome impacts and inequalities, such as worker pay disparities across many demographics, and the divergence of metropolitan economic outcomes. In light of that, this report presents a detailed analysis of changes in the digital content of 545 occupations covering 90 percent of the U.S. workforce in all industries since 2001. The analysis categorizes U.S. occupations into jobs that require high, medium or low digital skills and tracks the impacts of rapid change. The U.S. economy is digitalizing at an extremely rapid pace. Source: Brookings analysis of O*Net, OES, and Moody's data. In 2002, 56 percent of the jobs studied required low amounts of digital skills. Nearly 40 percent of jobs required medium digital skills and just 5 percent required high digital skills. A lot has changed. By 2016, the share of jobs requiring high digital skills had jumped to 23 percent. The share requiring medium digital skills rose to 48 percent. 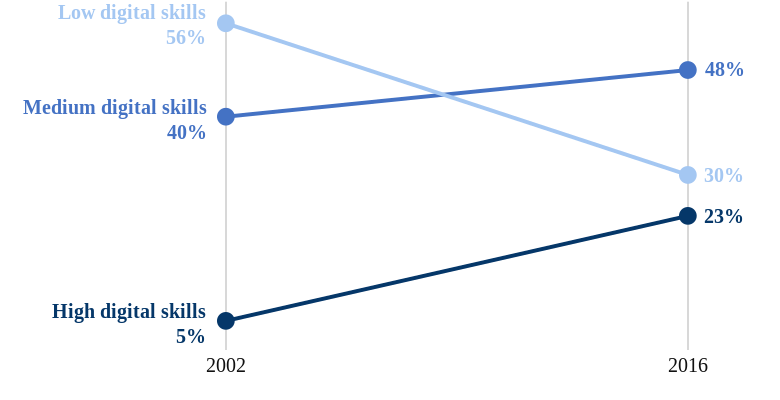 And in a huge shift, the share of jobs requiring low digital skills fell from 56 to 30 percent. The degree and pace of change of digitalization varies widely among occupations and across industries. 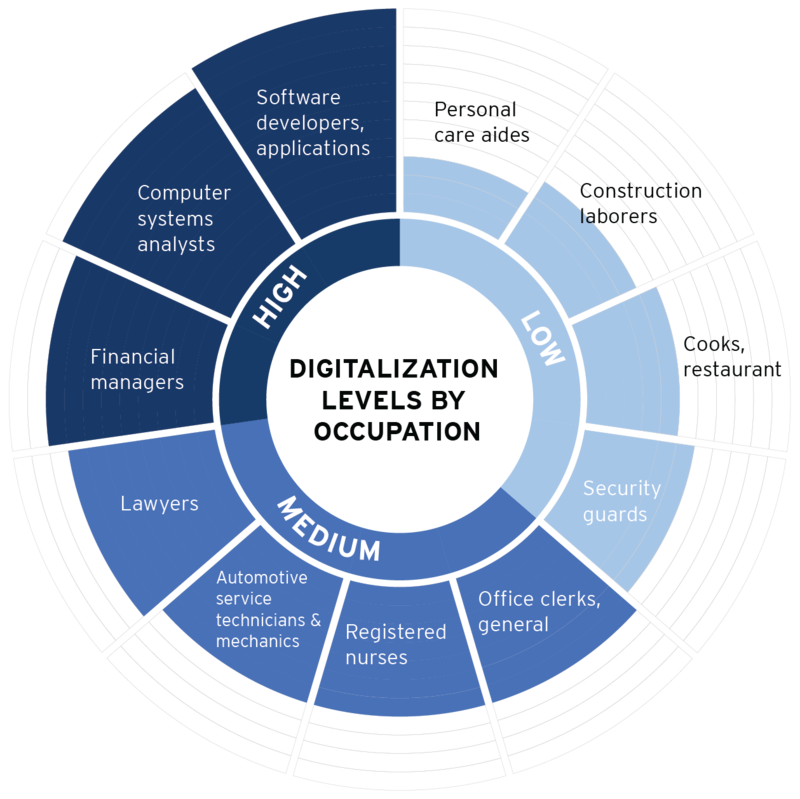 Digitalization scores rose in 517 of 545 analyzed occupations from 2002 to 2016. At the same time, the degree and pace of change has varied widely. The average digitalization score across all occupations rose from a low level of 29 in 2002 to a medium level of 46 in 2016, a 57 percent increase. Digitalization is associated with increased pay and job resiliency in the face of automation but also vastly uneven trends for job growth and wages. Sharp gender- and race-based challenges also exist. Metropolitan area digitalization is ubiquitous, but uneven.